Want to try your hand at some catch-and-release fishing? Anacostia Riverkeeper is hosting Friday Night Fishing on the Anacostia, starting June 17 and running through August 26, at the Diamond Teague Park dock, at the foot of 1st Street SE at Potomac Avenue. It's open to the general public of all ages, with gear and bait provided, along with instruction should you need a little help. Photo: What may be my best "Slider" so far, looking north along 1st Street from the Douglass Bridge, from 2006 to 2016. Go slide it yourself to see. * ORANGE: I mentioned this in the comments late last week, but now time to post officially that the BID has reported that Orangetheory Fitness has been signed as the first retail tenant at the ORE 82 apartment building at New Jersey and I, which is expected to open late this year or early next year. * CROSSING: Via Commissioner Fascett, ANC 6D is sending a letter to DDOT requesting a review of the pedestrian-crossing-light timing at 4th and M SE, aka the Teeter Intersection. "Twenty-seven seconds is not enough time for pedestrians, including seniors and residents in wheelchairs, to cross a six lane road while dodging two lanes of east-bound turning cars." * SPRINGSTEEN: Bruuuuuce is back at Nats Park on Sept. 1. Tickets go on sale to the public on Friday, May 13, at 10 am. 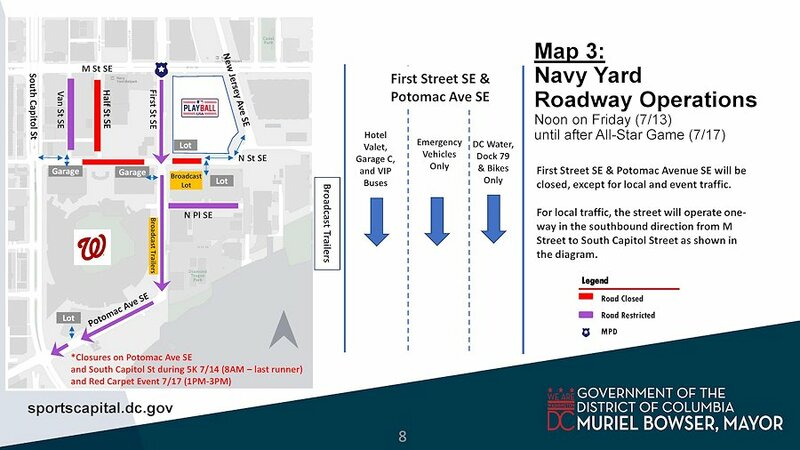 * ALLEN: If you are wanting some face time with Ward 6 councilmember Charles Allen, he is having his Community Office Hours on Friday, May 13, at the Starbucks in the Waterfront Safeway at 4th and M, SW, from 8 to 9:30 am. * SPOOKY: This has been in my hopper for too many months to ponder, but a reader passed along this link about the end of the National Geospatial Intelligence Agency building/Building 213 at 1st and M SE that included a few photos from inside (as I sob thinking about how I never got my own). * FITNESS: The BID has announced the schedule of outdoor fitness classes this summer at parks Yards and Canal.